As some of you may have noticed I took a couple weeks off, but that didn’t stop me from indulging in a few beers. The most memorable was an exploding bottle of Hitachino Nest XH. I pulled this out of my cellar when I decided to have a personal tasting of some barrel aged beers. 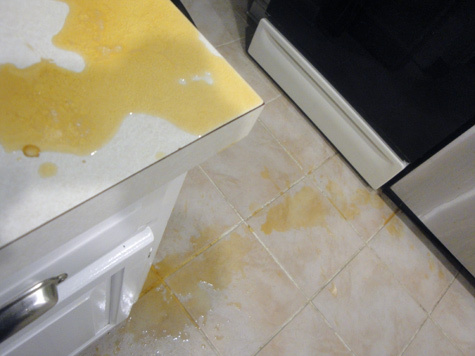 Normally a bottle of exploding beer would really piss me off, in this case it really pissed me off, why? Because it was so damn good. I believe this beer was from 2009, it had been in my cellar for a little over a year and a half. 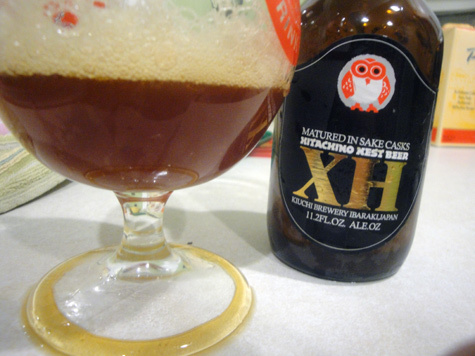 The Hitachino Nest XH is a Belgian Dark Strong ale which was aged in Shōchū (distilled sake) casks for 3 months. I had drunk this same beer at a Amanti Vino beer tasting and it was delicious, but this time around it was a different beast. When I say beast, I mean beast. When I popped the cap off, I had an explosion of beer, a fountain of beer came 8″ out the top of the bottle. It was impressive to say the least. However, it sprayed all over the place. As fast as my beer saving instincts could react, I tried to get my goblet under the glass and over to sink. After saving as much as I could I was amazed at the carnage in my kitchen. I was able to salvage about 3 oz of this beer and man was I in for a surprise. This was the best tasting infected beer I’ve ever had. At some point some wild yeasts got into this bottle and over a year created a super funky, slightly sour ale. Had I tasted this beer before I cleaned up the mess I would have been licking up the beer off the counter! I wish I would have saved some of this beer. It was just okay when I had it. I would venture to guess that the sake casks left some room for these to eventually take root. Makes sense with about a year of aging. Glad it tuned out nicely because I had some recent brews that didn’t infect so well. I had the exact same thing happen with my regular Hitachino Nest! 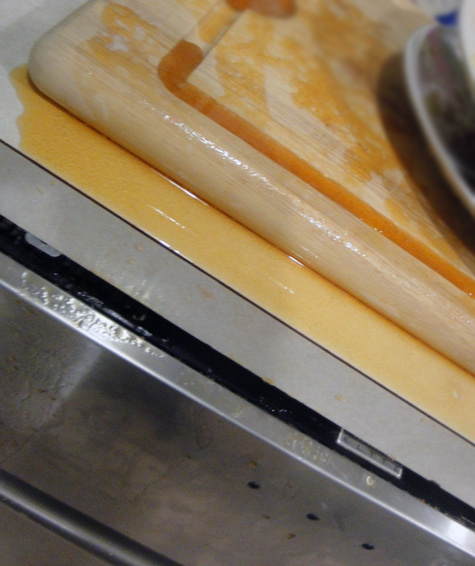 It was also infected but tasted pretty ok.
sounds like there is a bug floating around the brewery…. I’m surprised it was that good even though it was a gusher. Imagine how good it would have been if it had been a good bottle. I’ve only had one Hitachino Nest brew before, and it was damn tasty. Sounds like I need to try more! I’ve had most of their beers and find them to be either extremely good or really bad. the XH was really good “new”, the Sake barrels really give it a unique flavor. Definitely one worth looking for. Not sure where you are located, Lost, but I believe B United imports hitachino. I’m in MA, but I know I’ve purchased their stuff at my local liquor store before.